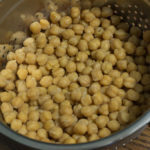 Rinse the chickpeas before adding them to the Instant Pot. Pour water over the chickpeas until they are covered by 3-4 inches of water. Sprinkle with salt and close the lid making sure the valve is closed. Set the Instant Pot to bean/chili setting for 45 mins. Once you hear the beep indicating the time is done allow the pressure to come down naturally which usually takes 15 mins. If beans are not tender enough, put them back under pressure for 5-10 minutes.